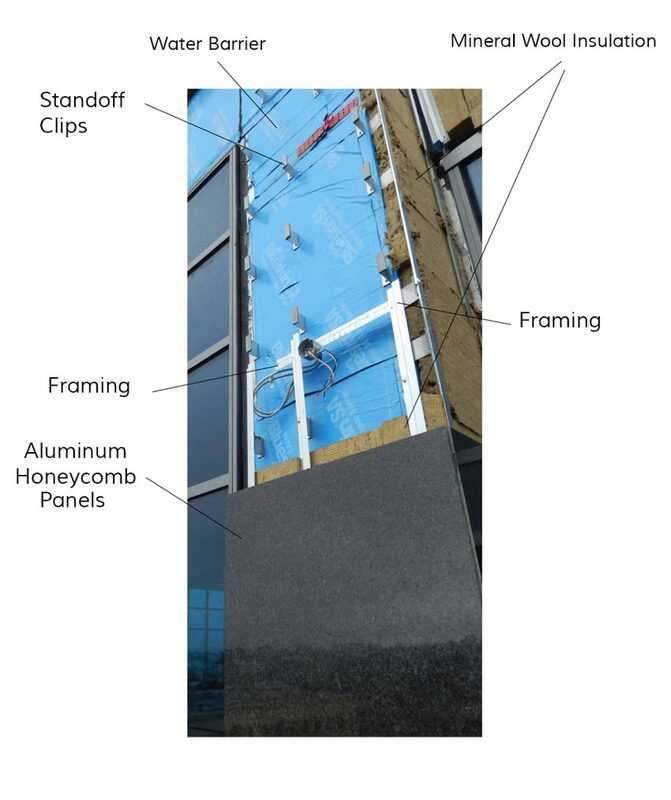 List the benefits of using natural thin stone veneer on aluminum honeycomb panels in a variety of applications. Compare stone veneer on aluminum honeycomb panels with traditional stone cladding in terms of design freedom, aesthetics, cost, service life, safety, and durability. List the varieties of stone available in thin natural stone on aluminum honeycomb panels. 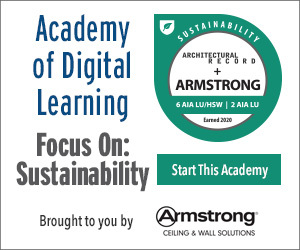 Discuss the characteristics of stone veneer on aluminum honeycomb panels in terms of green building goals. For thousands of years, stone has been a much-lauded ingredient in building design and construction. And with good reason. As a natural material, stone has many appealing qualities, including its unmatched durability, versatility, and unlimited beauty. Design choices know no bounds with stone’s wide-ranging variety of colors, types, patterns, and textures. Used over the centuries for everything from mighty ancient Greek and Roman structures, Egyptian pyramids, and English burial chambers to graceful churches and temples around the globe, stone has stood the test of time as a premier material choice. Stone veneer panels on aluminum honeycomb provide an innovative alternative to traditional stone cladding. Over the past hundred years or so, though, the use of stone in construction has waned. Traditional stone masonry is rarely used in modern buildings; its main drawbacks have been its unwieldy weight, high labor costs, and quarry, cut, and transport challenges in getting stone from point A to point B. Today’s architects, however, looking for innovative ways to incorporate stone’s many benefits into their current projects, no longer need to dismiss stone as an option. A lighter, cost-effective, sustainable, and proven product is available: lightweight aluminum honeycomb-backed reinforced stone panels. 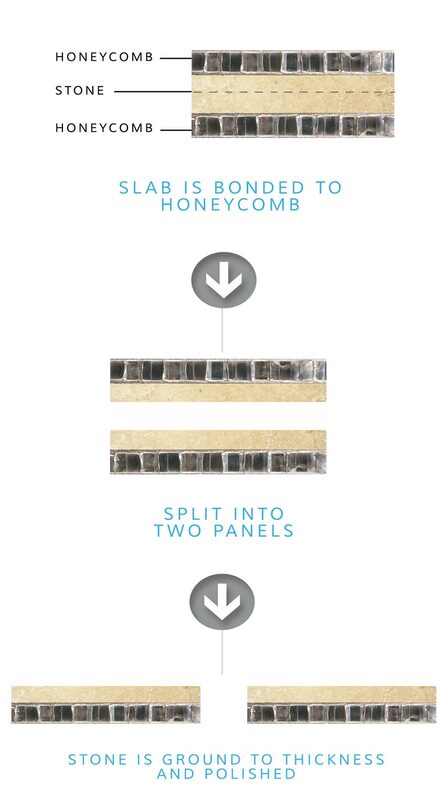 Natural stone veneer on aluminum honeycomb panels are composite panels consisting of a thin layer of natural stone (such as granite, marble, travertine, or limestone), typically 3/4-inch to 1/4-inch thick, bonded with high-strength epoxy (think aircraft quality) to a lightweight yet extremely durable aluminum honeycomb backing. The total panel thickness including stone and aluminum honeycomb is typically either 3/4 inch or 1 inch. The panels offer designers the beauty of the natural stone face combined with aluminum’s increased strength and light weight. The panels are typically custom made to the size and shape required for the specific project. Corners, sills, and special shapes can be factory fabricated. 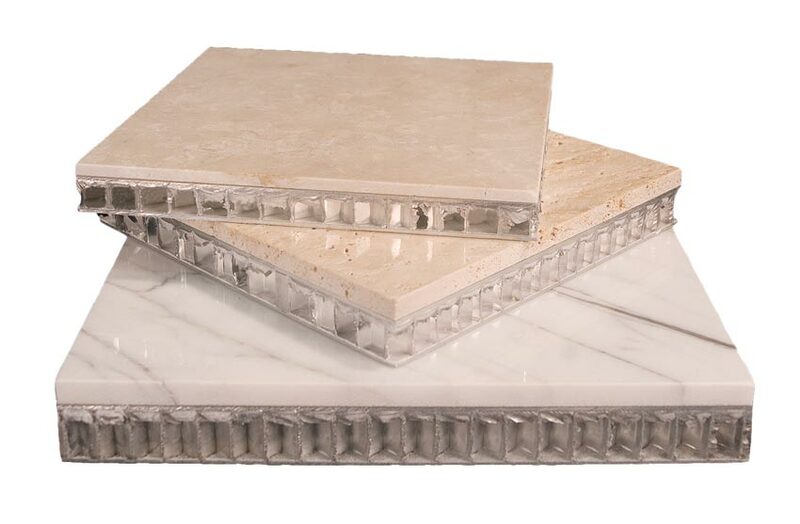 Natural stone facing is attached to the aluminum honeycomb backing with an extremely durable aerospace-grade epoxy. The Process: How Does It Work? The panels are custom fabricated in the stone type, color, finish, size, and shape selected by the designer. The first steps involve providing stone samples and shop drawings to ensure the designer’s vision is being expressed. Once shop drawings and submittals are approved, the manufacturing process begins. The manufacturing process starts at the stone quarry, where large blocks of stone are extracted. The blocks are then taken to giant saws where they are cut into slabs, typically 11/4 inches thick. 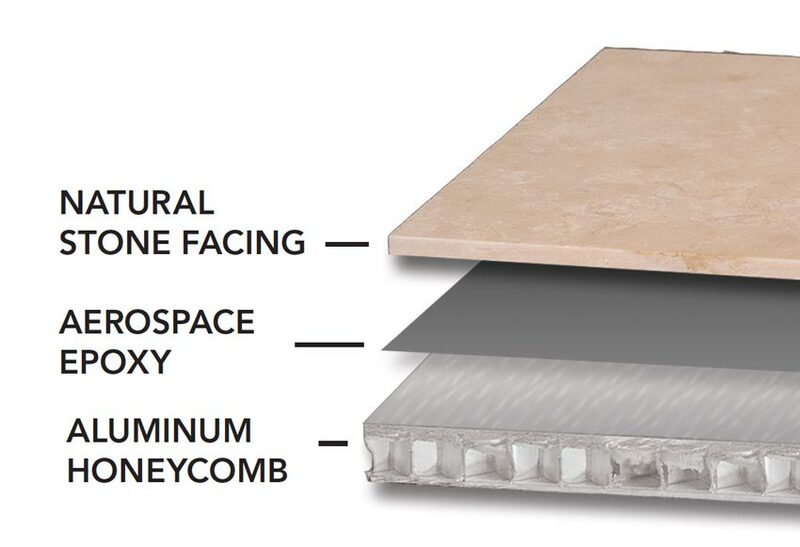 The aluminum honeycomb panels are prefabricated with high-quality aluminum, which are then bonded with aerospace-strength epoxy to each face of the stone slab. The aluminum backing increases the strength and impact resistance of the stone and makes installation much easier and more secure than with traditional veneers. Panels weigh just 3.5 pounds per square foot but offer impact resistance up to 60 times greater than stone slabs. At this point, the panel is a sandwich of aluminum honeycomb on both faces with the stone in the middle. The panel is then sawn down the middle of the stone slab to produce two panels with stone veneers roughly 5/8 inch thick. Next, the panels go to the finishing process where they receive a final finish and texture. Depending on the project and the designer’s preference, the finish can be polished, honed, flamed, sandblasted, or tooled. Other options include carving or laser engraving. The panels then go to the fabrication area, where they are cut to the specific dimensions required for the project and corner pieces and any special shapes are custom fabricated. Finally, the panels are packaged along with installation drawings and instructions and shipped to the jobsite. Pictured here, the process of how the stone panel is cut, ground, and polished. Finally, the panels go to the jobsite for installation. Powered by Building Media, Inc.